When it comes to tools, trucks, and work boots, never waste your time and money getting something that's second rate; you’ll be back replacing it before you know it. When you want the best of the best, no messing around, no cutting corners to get a better deal, y ... (see full details) (see specifications) #25381. When it comes to tools, trucks, and work boots, never waste your time and money getting something that's second rate; you’ll be back replacing it before you know it. 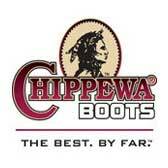 When you want the best of the best, no messing around, no cutting corners to get a better deal, you want Chippewa footwear. Proudly assembled right here in the USA by master craftsmen with plenty of experience in what they do, you receive an investment that will last so long, these will feel more like a part of the family than footwear. These Chippewa Insulated Composite Toe 25381 Men’s Black Loggers are tall, dark, and handsome, made with only the toughest materials, but with a soft side too, making sure you have the best work day, every day. For added safety, these loggers are made with ASTM approved non-metallic composite safety toes to protect you from impact and compression accidents, they are also rated EH - electrical hazard - for protection in certain dry electrical environments. These 9-inch tall insulated logger boots start with heavy-duty black oiled leather uppers for durable, waterproof protection for your feet. This dense leather is strong and mighty, made from the best cut of hide for long-term performance that won’t let you down, even in the some of toughest of conditions. Thick and strong, yet supple and flexible - just because this leather is durable that doesn’t mean it’s stiff. In fact, as these Chippewa insulated men's boots break in, the leather is conform to your individual foot, thanks to the lace-to-toe systems built right into the design. From your toe up, you'll have a nearly custom fit that only gets better with time. Lined with Chip-A-Tex waterproof breathable membranes, water from outside these boots cannot penetrate into the interior, while moisture produced by your feet as you work is expelled. This remarkable technology keeps you dry from the inside out, pulling fresh air to push out the moisture, sweaty vapors as you work. The Dri-Lex quick drying linings aid this process by wicking your sweat away, while the 400 grams of 3M Thinsulate Ultra insulation traps the body heat released in this process, holding it close to your skin for the added warmth you need to get through your day in the cold. Just because these composite safety toe boots are aggressive and rugged on the outside, that doesn't mean they're the same on the inside. When you slide your feet into these insulated logging boots, you're greeted with Texon insoles for cushion. With every step, your feet are guarded from the pain of impact by the rebound of these durable insoles. For added support right where you need it, OrthoLite removable orthotic inserts provide targeted ergonomically designed support for your feet. Whether you’re walking on rough, uneven terrain or hard, flat surfaces, these comfort features will keep your feet from experiencing the stress of impact so you can enjoy more stamina in your day. Working in the woods can be a potentially hazardous job, and these waterproof EH black boots are ready for just about anything. The tough and rugged Vibram Q518 Black Street Warrior outsoles are some of the best in the business and ready for action. The self-cleaning lugs and wide stable platform of these outsoles help to stabilize every step and provide traction, even when it’s slippery. Both heat- and fire-resistant, these outsoles are ready for the really difficult jobs. Connected to the uppers with the intensely durable Goodyear Leather Storm Welt construction, you have the support of the strongest construction in the business, ensuring these composite toe Chippewa boots never fall apart. When you finally manage to break down these durable outsoles, the Goodyear Welt allows the men's boots to be re-soled by a skilled shoe repairman - like putting new tires on your truck - for a whole new life on this investment. For added safety, these loggers are made with ASTM approved non-metallic composite safety toes to protect you from impact and compression accidents, they are also rated EH - electrical hazard - for protection in certain dry electrical environments. With everything you need made to a standard that ensures you won’t be back for replacements any time soon, choose these Chippewa Insulated Composite Toe 25381 Men’s Black Loggers from Working Person's Store. Made to keep you safe, warm, and working hard for season after season, this is an investment that lasts. Wow! Wow, again! What customer service! My wife is a sales manager for a giant retailer, also a former operations director and H/R. We both appreciate and nuture great customer service. Herewith, I so delcare: A) you got back to me in record time; and, B) you're offering to make two shipments, both free, to accommodate an older, chilly customer who appreciates a thick shirt. Okay, on a 1 to 10 scale, you rate a 17.28! Chippewa Boots: Insulated Composite Toe 25381 Men's EH Black Loggers is being added to your cart.